So, I have a few things to catch up on from the weekend. On Friday, one of my layouts was posted on the Cosmo Cricket blog. 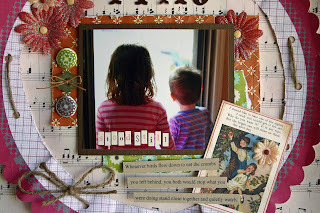 I love CC so it was so fun to see my little guy (and my layout :0) on their blog). We had a pretty relaxing weekend. Not too much to share there. I did take a couple of pictures, but they haven't been loaded up yet so I'll have to share those later. 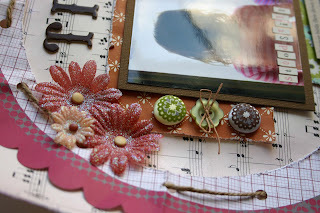 And Monday means the new ScrapTiffany challenge is up. 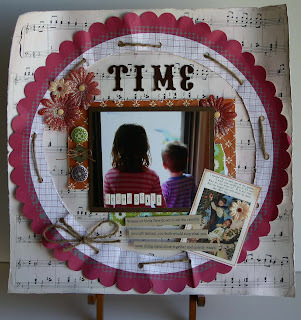 This week's challenge is to scrap Time. The challenge is open to your interpretation. Go check out everyone's take on the challenge--everyone's take was different. Here is mine. I don't usually do tons of distressing, but I really got into it on this one LOL. Some Tattered Angels mist on the background patterned paper. Plus all the October Afternoon patterned paper was distressed with an edge distresser. The scallop circle from Little Yellow Bicycle was also crumpled. And I swiped some ink on the October Afternoon card. Since I am not usually a big distresser I had a lot of fun stepping out of my comfort zone. Don't forget to get your take on the challenge to Tiffany before the end of the month for a chance to win a free ScrapTiffany kit! Great blog! Congrats on the LO on Cosmo Cricket's blog---that is awesome! Hi there Rebecca! Thought I'd hop over from 3SB. Love your blog. And BIG CONGRATS on the CC layout! Beautiful layour Rebecca! And congrats on the Cosmo Layout! Love the distressing on your layout. It turned out gorgeous!!! Your layout is so gorgeous, rebecca! And big congrats on making it on the CC blog - how exciting!